Do you remember the days when information was in the hands of the privileged few? It was just a few decades ago that parents would even sacrifice meals to own a set of encyclopaedias, hoping to give their children an edge because “knowledge was power”. Once upon a time, knowledge was also power for the salesperson. Sellers had information that buyers didn’t, but the world wide web and social media has flipped that on its head. Buyers now decide how, when, and even if to engage with salespeople. They have more access to information, more choice, and their sales and service expectations have increased. As a result the role and core competencies and processes of selling; and how we recruit, train, lead and equip salespeople have changed. Sales and service is a new game, with a new set of rules. The skills and qualities for successful salespeople today are different. Some of the best skills a salesperson can develop include asking questions and listening to clarify motives and find the “right problem to solve”, picking up on buying cues, and having the skill to improvise what comes next. Have you ever considered that drama and improvisation lessons may be some of the best training for your sales people? It makes even more sense when you consider the immense power of effective storytelling when it comes to engaging prospects and customers. The challenge for buyers now is not lack of information, but too much. Salespeople can add real value by curating information and cherry picking resources that are timely, relevant, and meaningful to individual customers and prospects. And here’s the real key to the kingdom: People buy from people they know, like and trust, and they don’t care how much you know, unless they know how much you care. The best salespeople have a real desire to “serve” the customer in the best way they can – even if it means they sometimes miss out on an immediate sale. Move from upselling, to upserving. Strangely enough, this’ll also be your best weapon to overcome any resistance your salespeople have to selling. Selling has a bad rap – but most of us feel even better when we help others, than when we help ourselves. Your salespeople are your eyes and ears. More often than not they can identify and articulate what buyers really want, and how well or how poorly the company is serving those needs. They are a valuable source of new ideas for products and ways to serve customers better, or more efficiently. How well do you listen to and respond to your sales people, and keep them in the loop? …And here’s a tip that comes from the Synchronised Sales programme that we created here at oAi. It’s a question to ask each and every one of your team, and it works a charm. When I use this question the answers always surprise and astound – and the energy of the team grows. The team members feel significant, empowered, heard and valued; they get to grow and progress in a way they find meaningful, the company gets new ideas and resource to grow sales, customers are better served – and sales and staff engagement soar. Go on – give it a go. Of course, when this question is used in tandem with the entire programme it’s power is magnified, but still incredibly valuable and mind blowing on it’s own. In a world of agile sales where the sales funnel is more like a sales web, and authentic relationships rule, Sales Managers need to empower their sales team with the autonomy, resources, and ability to be agile and to improvise, and to bring their own natural style to the interactions. Increasingly we’re seeing that team commissions and rewards tied to team or company performance outperform individualised reward when it comes to impact on the bottom line. This approach also promotes and encourages collaboration, and teamwork. The mass market is largely dead. Today buyers want and expect products and services that they perceive were almost made for them, and they want them when they want them – ie now. I recently tried to open a business bank account and was informed that my enquiry would be responded to in two days. Guess what – when they rang ten days later I had an account with another bank. Buyers today want and expect real time sales and service. Two days is not OK, and ten days sends a clear message that they don’t want my business. If it takes them that long to respond to a sales enquiry, how long would it take to respond to me as a customer if I had a serious issue? – it creates doubt. And remember – buyers buy on emotion, and then rationalise with logic. That’s why storytelling and building trust are so powerful. Yes, even in the enterprise market, but here the emotional component is a lot more covert. The gap between sales and marketing is narrowing. They need to work together, and with their customers to grow market and customer understanding, – and identify the strategies, collateral, content, and resources that will make a difference. Marketing provides for the macro level, while sales is devoted to serving the needs of individual buyers. If you’re not sure what a buyer persona is, or haven’t got yours sorted, a great resource is the Customer Empathy Map by Alexander Osterwalder. High tech, high touch is a powerful combination for selling especially when you consider the demand for real-time and agile service and sales. Simple tools and apps like Tweetdeck, Signal and SideKick are now available to help you identify who’s looking at and considering what, and when. If a sales person can enter the conversation when the purchase is top of mind, and add real value to the purchasing decision the chance of a sale increases exponentially. Likewise, if a support or service person can identify and respond to complaints in real time – the chances of not only retaining a client, but repeat business, and positive word of mouth are boosted. By and large, CRM systems have not kept up with the new rules. Almost all are designed to capture the movement of a prospect through a sales funnel without any real understanding that the buyer is now in charge of the process, and it isn’t quite the nice predictable funnel it used to be. The CRM system is almost always geared to provide the Sales Manager with a mechanism to report and predict sales, rather than a tool to help add real value to salespeople to facilitate the sale. Select your salespeople wisely, ensure they’re aligned – and give them freedom to move. If you can’t trust your people to do the right thing by your customers and your business – there’s something wrong that won’t be fixed by cracking the whip. A few years ago I was on the leadership team for a significant Australasian bank. Part of my role involved sales coaching. The people I worked with faced a challenging dilemma on a daily basis. 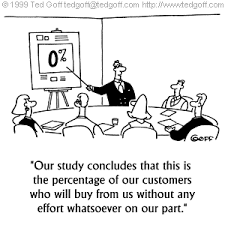 They wanted to do what was best for the customer, but they were not empowered or trusted to do this. The pressure and drive to meet targets overpowered the drive to serve customers best. Is the way you measure performance and set targets helping or hindering your short and long term sales results, customer satisfaction, and team engagement? If the behaviours you’re driving through targets are counter to your overall mission, or creating conflicting objectives – get creative, take action, and fix it. If you want to learn more about the new rules of selling I particularly like the work of David Meerman Scott and Daniel Pink. Both are thought leaders in this sphere, providing valuable and more detailed insights than I can possibly cover here. Great books include The New Rules of Sales and Service: How to Use Agile Selling, Real-Time Customer Engagement, Big Data, Content, and Storytelling to Grow Your Business , by David Meerman Scott; and To Sell Is Human: The Surprising Truth About Moving Others , by Daniel Pick. The market is ripe for organisations who are willing to embrace the new rules. It’s a very real opportunity to stand out in a sea of sameness to win valuable long term business, and your people and your customers will love you for it. About The Author: Lisa McCarthy (M.Comm) is the creator of the Optimal Agility methodology. She is the driving force behind the vision and strategy for oAi, providing leadership and direction for partners and teams across the network. Through her speaking, coaching, corporate training & private consulting services, CEOs, executives and teams quickly discover new possibilities and opportunities, and develop the desired adaptations in their culture and organisations that counteract the rapid market and environmental shifts that besiege them. Her areas of expertise and interest include business agility, entrepreneurship, intrapreneurship, innovation, effectuation, sales, personal development, human potential, blue economy, leadership and coaching.